Accra, July 4, GNA - James "Hot Ice" Obedi Toney defeated his compatriot Ayittey Powers on Sunday morning at the Accra Sports Stadium to win the vacant World Boxing Council (WBC) International and the Commonwealth middleweight titles. The two titles were at stake. Toney, who was originally billed to fight South African Mpush Makembi for the titles had to sweat thoroughly to wrestle the titles from Powers, who was a last minute replacement for Makembi who had failed to turn up. All three judges scored the fight in favour of Toney as Godfrey Cobblah made it 118-108 and Folorunsho Jacobs from Nigeria had it 117-111 while Atta Eddie Pappoe scored it 118-109. Toney dominated the early minutes of the first two rounds but Powers found his range in the final minutes and connected some good right punches to draw cheers from the fans. In the third round Toney began to press harder and pushed Powers backwards with combination punches but the substitute hammered Toney with a big left and a murderous right that stunned him. By the fourth round, Ayittey had gained in courage to force Toney into reverse gear as he countered very well and dug in to neutralise his opponent's longer reach with some body shots. Though Ayittey displayed a lot of willingness to fight, it was evident that he had not prepared adequately for the fight as he began to slow down and allowed Toney to throw many more punches than he did. But anytime he fired a punch, it was precise, thus betraying the poor defensive formation of Toney whose contentment was to chase Ayittey around even if he became vulnerable in doing so. Ayittey hit the canvas in the sixth round when Toney connected a right to his midsection and Belgium referee Bob Luced administered the mandatory eight count. Midway through the round, Ayittey appeared fagged out as he clung onto the ropes with his right hand, compelling the referee to administer the standing count once more. There was a remarkable recovery from Ayittey from the ninth round as he chased Toney round the ring but the champion made use of his longer reach and connected some punches on the retreat. The last three rounds offered a lot of excitement as both boxers flipped through the pages of their boxing books and excited the crowd with superb ring-craft. Toney tried to silence the crowd, which had turned in favour of Ayittey and the latter also fought gamely as he ducked and dodged most of Toney's punches while he succeeded in delivering some power hooks to ward off his opponents aggression. The last round was particularly interesting as the two boxers plucked their last gap strengths to pummel each other with the hope of impressing the judges. It was indeed a good fight befitting a WBC championship. 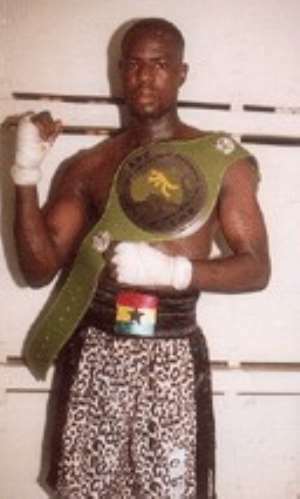 In other fights on the Landmark Promotions and Management Limited bill dubbed "the Night of Redemption and Remembrance," Anyetie "the Chemeleon" Laryea regained his National and West African super bantamweight title when he scored a majority points decision over the champion, Jonathan Yartey. Brimah "Bukom Banku" Kamoko overpowered his Nigerian opponent Babatunde Alimi in their light heavyweight contest as referee Emmanuel Brenya stopped proceedings in the seventh of their scheduled 10 round contest. Abdulai "Classic" improved his record to 17 fights without defeat when he stopped Steven "Ataa Gyata" Okine in the sixth round in a super lightweight duel, while Republic of Benin gladiator, Ange Adjaho gained a unanimous points decision over Sunday Okoli of Nigeria. Former Commonwealth middle champion Charles "the Crusader" Adamu recorded a third round TKO win over Raul Lokko from the Republic of Benin, while Alex Brew won a unanimous decision over Mohammed Jess in their eight round lightweight contest and George Assie recorded a third round TKO over Mustapha Appiah who had a cut on his left eyebrow.